NEW YORK (AP) — Richie Havens, the folk singer and guitarist who was the first performer at Woodstock, died Monday at age 72. His performance at the three-day 1969 Woodstock Festival, where headliners included Jimi Hendrix, was a turning point in his career. He was the first act to hit the stage, performing for nearly three hours. His performance of "Freedom," based from the spiritual "Sometimes I Feel Like a Motherless Child," became an anthem. Havens' website said that he had kidney surgery in 2010 and that he never recovered enough to perform concerts like he used to. He performed at Bill Clinton's presidential inauguration in 1993. Havens, who released his breakthrough, "Mixed Bag," in 1967, released more than 25 albums. He sang with doo-wop groups on the street corner in his Brooklyn neighborhood at an early age. At 20, he moved to Manhattan's Greenwich Village, where he performed poetry, listened to folk music and learned how to play the guitar. 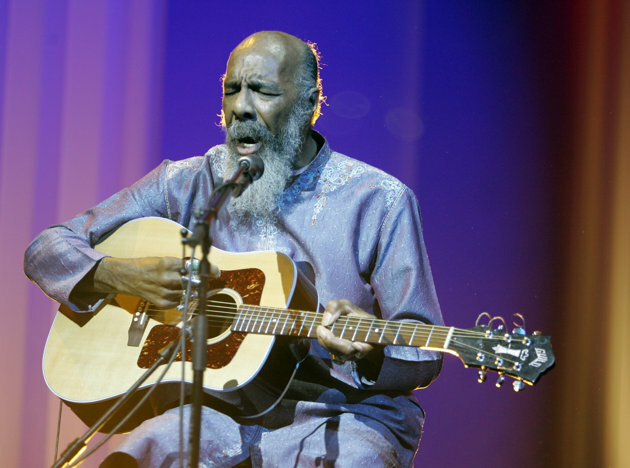 "Richie Havens was one of the nicest most generous and pure individuals I have ever met," Stills said in a statement, adding that Havens was unique and could "never be replicated." Havens also became an actor in the 1970s and was featured in the original stage presentation of The Who's "Tommy." He appeared in the 1974 film "Catch My Soul" and co-starred with Richard Pryor in "Greased Lightning" in 1977. Havens was the eldest of nine children. He is survived by his three daughters and many grandchildren. A public memorial for Havens will be planned.